When you hear about hair foiling, you probably think of that not-so-attractive look when you’re getting highlights done and there are huge layers of aluminum foil sticking out of your hair. But Sarah Lund, a Kevin Murphy stylist, is about to change that image. Lund has created a beautiful new styling trend that’s begging to be worn during the holidays. Lund cuts up tiny flecks of silver, gold or copper foil and meticulously places them concentrated on certain areas of hair for a futuristic and beautiful look. Sometimes she puts them along the part line of middle-parted long hair or she clusters them all around the crown. The result is absolutely gorgeous. Want to try the hair trend at home? Lund starts off by prepping damp hair with a setting lotion and then drying it roughly with her hands. To give hair extra volume, she relies on Kevin Murphy Anti Gravity Spray. 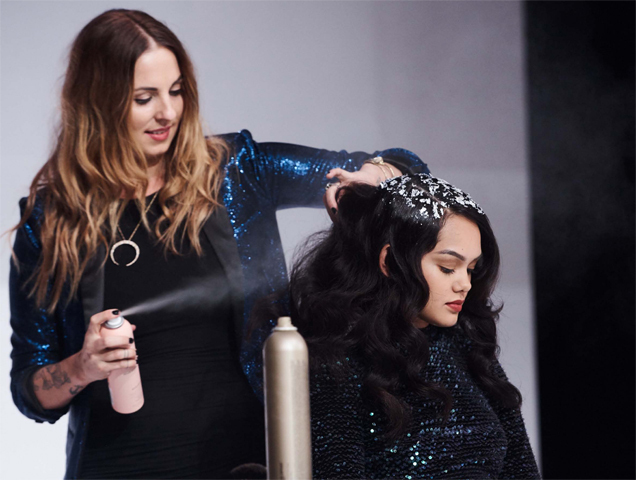 Once hair is dry, Lund uses a large barrel curling iron to amp up the volume even more. She makes sure to hold the iron horizontally so she creates soft waves instead of curls. Once the curls are done, she tones them down by brushing through them while gently working in hairspray, like Kevin Murphy Session Spray. Now here comes the fun part: adding the flecks of foil. Once you’ve decided where you’re going to place them, spray the area with hairspray. Lund’s pro tip: Spray a smaller area than you expect since you’ll be fanning it out once the foils are set in place. 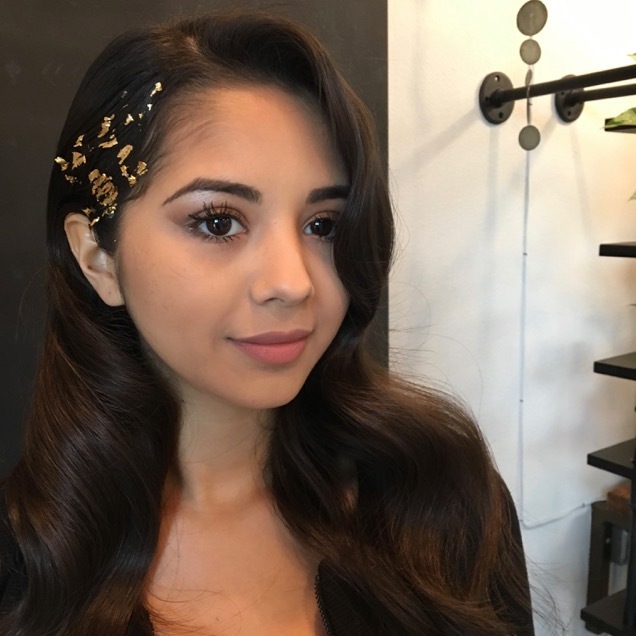 Once the sprayed area feels nice and tacky, place the foil flecks in a pattern you like and then pat them into your hair with a small makeup brush. Lund then likes to add an extra spritz of hairspray to keep everything sturdy. To make sure the foil looks as effortless as possible, she suggests using an eyeshadow brush to gently spread the foil apart and create a haphazard look. This look takes no more than 20 minutes to complete and leaves you with the most show-stopping holiday hair ever. You’ll have the most impressive Instagram snaps this season, trust us.